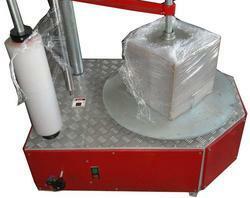 Automatic box strech wrapping machine . We offer Box Stretch Wrapping Machine to our clients. Size: 2ft x 1.5ft x 1.5ft box. Or max. Diagonal length 700mm. CARTOON WEIGHT: 50 KG MAX. CARTOON SIZE: 30 X 30 X 30 MAX. Backed by years of industry experience, we are engaged in offering a premium quality range of Box Stretch Wrapping Machine.